A drawing in ink depicting two figures in Oxford University dress, by S.H. Grimm. Detailed rules governed what members of the university should wear, and it is possible to recognize the degrees held by graduates and the social rank or status of undergraduates by their robes. The figure on the left is a Nobleman undergraduate, a peer or son of a peer, wearing his everyday (undress) gown. It is made of black silk and has wide, open sleeves and a folded pyramid of material (tippet) hanging from the left-hand lower corner of the yoke, to which the pleats of the back and sleeves are gathered. His mortarboard is covered in black velvet and has a gold tassel. 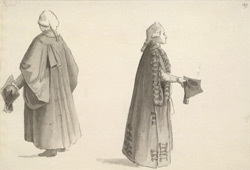 The figure on the right is a Gentleman-Commoner, an undergraduate of superior social rank, in his full-dress gown, which is worn at gatherings of a formal or ceremonial character. It is made of black silk and has long, closed sleeves. The sleeves and the skirt of the gown are decorated with rows of braid and tassels. This description was provided by The Burgon Society, which was founded to promote the study of academical dress.